Lawyers passionate about defending their clients and showcasing their work frequently document their thoughts and provide firm updates in a law firm blog. 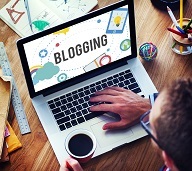 Blogging has proven to be an effective legal marketing tool, according to an article by inbound marketing company Hubspot, which has found professional blogs receive more links to their websites, are perceived as a trusted source of information, and obtain more leads than their non-blogging counterparts. However, what one Michigan no-fault attorney posted on his law firm blog has landed him in hot water—specifically with a complaint being filed against him for what he perceived as free speech protected by the First Amendment. This incident, which is detailed more fully in Tracy Gentilozzi’s LinkedIn article, “Michigan attorney faces discipline over blog post,” opens the debate of whether attorneys need to be more cautious when blogging. In November 2014, attorney Steven M. Gursten wrote about the so-called “9 hatchet job tactics” Dr. Rosalind Griffin, a well-known Michigan independent medical examiner (IME) and member of the Attorney Discipline Board, used against his client in a particular case. Even more interesting is how Gursten responded to make his point that attorneys are covered by First Amendment protections. He shared Dr. Griffin’s entire trial testimony by video and the full unedited transcript of her testimony on his blog. The debate comes down to whether lawyers should be able to use their professional blogs to “expose” perceived misconduct of a judge, opposing counsel or someone else also involved in a case. There has been an occasional incident of attorneys facing discipline over disparaging remarks on blog posts, and in those cases, the First Amendment was not guaranteed as safe harbor. One example cited in the article was in regard to a 2008 case where a Florida defense attorney was unhappy about a judge’s handling of a case and publicly complained on his blog about perceived inappropriate behavior. The Florida Bar concluded the lawyer violated five ethics rules, taking him to task on false or reckless statements regarding the qualifications or integrity of a judge, and engaging in professional conduct that is prejudicial to the administration of justice. The Florida Supreme Court also rejected his First Amendment claims and in the end, the attorney agreed to a public reprimand and a $1,250 fine. Client information is always confidential. You may be writing about a particular case, but do not go into so much detail that you risk disclosing confidential client information. No advertising. Make sure the style of writing does not ‘read’ as attorney advertising. An “About the Author” section at the bottom of a blog post can serve to provide basic information on the attorney’s background and services. Pause before pushing the “publish” button. Just because a rant was put in writing doesn’t mean it has to be posted. Before the blog piece gets published, make sure it comes across as professional, not petty, and edit it accordingly. That advice goes for all social media channels that lawyers use to update their followers. Will the Michigan lawyer’s blog posts serve as a cautionary tale to other law bloggers? Or will asserted First Amendment protection prevail in this case? We just won’t know until the State Bar of Michigan completes the investigation and provides guidance in this growing field of legal marketing. However this incident underscores the importance of being meticulous with the facts and the manner in which they are presented when posting on a law blog. In this author’s opinion, it is much better for a blog to focus on substantive legal issues that can attract and inform prospective clients, rather than serve as a sounding board for professional disputes. Margaret Grisdela is president of Legal Expert Connections, Inc., a national legal marketing agency, and author of the book Courting Your Clients. She specializes in insurance defense marketing, employment law marketing, and serving as an outsourced legal marketing director. She welcomes all law firm inquiries. Connect via LinkedIn or at 1-866-417-7025.